Do you want to know how to apply for Ghana National ID Card (Ghana Card)? You’re at the right place. In this guide, we’ll take you through the process of obtaining a Ghana Card online. You also get to know the full requirements and the registration centres for Ghana National Identification Card. The National Identification Agency (NIA) is solely responsible for issuing of the Ghana Card. The National ID card also called Ghana Card is meant to be the primary ID card that citizen will use to access all services in the country. In fact, every Ghanaian citizen living within the country and abroad has the right to be in the National Identification System and citizens from age fifteen (15) are entitled to be issued with a national ID card. The Ghana Card will be the only valid ID for application for a bank account, passport, drivers license and much more. Who is Eligible to Apply for a Ghana National ID Card (Ghana Card)? The Ghana National ID Card otherwise known as Ghana Card is a national identity card that is issued by the National Identification Agency (NIA) to Ghanaian citizens – both resident and non-resident, and legally and permanently resident foreign nationals. It is proof of identity, citizenship, and residence of the holder. All Ghanaians (living at home and abroad). All persons that hold Ghanaian citizenship in addition to the citizenship of any other foreign country (dual citizen). Persons from aged 15 years and above. Below are the general requirements for the Ghana Card application. Personal Information – Name, Date and Place of birth, Residential address and digital address code. Information About Parents – Their names, Address dates and places of birth etc. Next of Kin – Address of next of Kin. Supplementary Spousal List for those with more than one spouse. Primary Verification Documents – Individuals would be required to present any of the verification documents (i.e. Birth certificate, certificate of acquired citizenship or valid passport) to help validate the information provided. 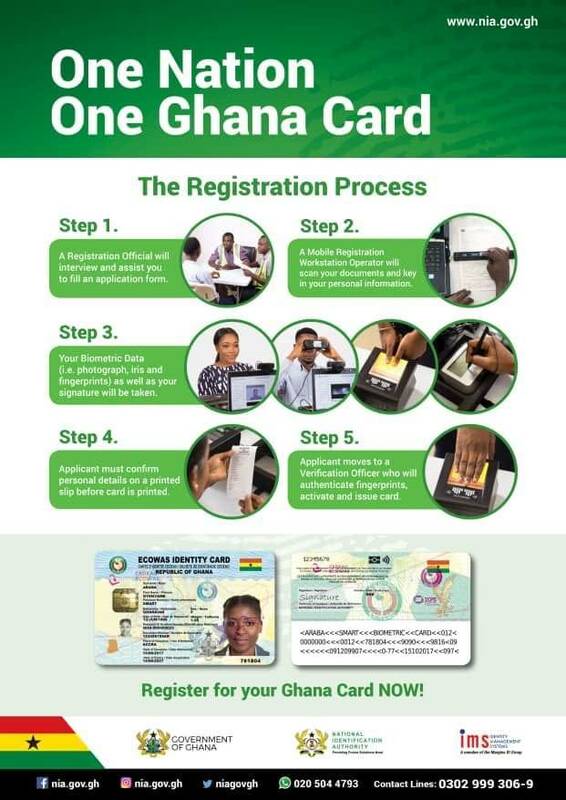 The registration process for the Ghana National ID Card involves just three steps. Visit the nearest registration centre and get the National Identification Authority (NIA) registration form. You’ll be assisted by a registration official in filling the form. After filling the form, crosscheck to ensure the information is correct. Submit the completed form to a Mobile Registration Workstation (MWR) Operator. Your Photograph will be taken using a digital camera attached to the Mobile Registration workstation and your signature will be taken using an electronic signature pad. The biometric data and personal information are then merged to create a digital identity for you. You’ll be issued with an ID Card Collection Slip/Receipt. You need this reference slip to collect your card when it is ready. When your Ghana Card is ready, you need to come back with the ID Card Collection Slip that was issued on the day of registration. Once you get to the registration centre, follow the procedures below to get your ID Card. Report to the Distribution Officer. Present the ID Card Collection Slip to the Verification Officer. Your details will be checked among the list to know if your Ghana Card is ready or not. If your card is ready, the verification officer puts it in the pick-out box and stamps your collection slip and forward it to the Authentication Officer. Your fingerprint will be taken again for authentication by the Authentication Officer. If they match, the collection slip is stamped delivered and you’ll collect your ID Card. As at the time of this publication, the Ghana Card registration centres is only available in the Greater Accra region and will move to other regions in the country. It is important to note that, the process of registering for Ghana National ID Card is absolutely FREE. The Ghana Card has a processing time of five (5) working days. That is to say, after your registration, you should wait till after five days before your card is ready.